To kick-off the meeting, the public transport operators participating in ACTUATE exchanged their views on the safe eco-driving training concepts and materials for different clean vehicles types they have developed. The partners also reported on their experiences with the pilot-trainings that had already been carried out for drivers of trolleybuses, trams and hybrid-buses. On the second day of the meeting, all project partners presented their concept for a motivational in-house campaign that will communicate the benefits of safe eco-driving to the drivers. Together with the other partners each individual campaign was discussed in order to ensure a lasting impact of the ACTUATE trainings on all participating drivers (see also news below). Finally, all meeting participants took the chance to be on board of TEP's new Van Hool trolleybus vehicle for a test drive through the city. The test drive was organised to demonstrate a new software solution that measures and records the vehicle's energy consumption in real-time. 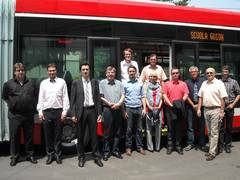 The tool was developed by ACTUATE partner Van Hool in cooperation with Vossloh-Kiepe, a supplier of electrical systems for urban transportation vehicles, and will be the basis for the development of safe eco-driving concepts for trolleybuses equipped with supercaps.